It is the era of data. Big data, machine learning, predictive analytics and data visualization are taking the front seat. Online portals now use shopping data to send targeted ads, even Google is not left behind as it uses its data to enhance their search results. Elections are now based on data. An individual’s data at registration must match with that at voting; and votes from constituency must add up. A data revolution is at hand, and it is transforming every industry. Data revolution is needed to help accelerate progress towards achieving sustainable development goals. According to Jeffery Sachs, new data systems are needed to turn SDGs into a reality by 2030, especially in four areas: data for service delivery, data for public management (real time dashboards), data for accountability, and public data for progress towards goals/targets. To enhance health and healthcare, policy makers, researchers, organizations and government agencies need health information on health status of population groups, patterns of diseases and illness in various groups and settings, use of, access to and evaluation of healthcare services to assertively make decisions that will guide public health interventions, and policy planning and making. There are however several challenges that are met with the utilization of health data. These include data availability and accessibility, as well as understanding complex data. Healththink was developed to solve these challenges. There is an increasing need for health data to be free and open, resulting in health data being easily consumed by all. One of the most important features of Healththink is Data Aggregation and Integration. Despite the regular collection of health data by individuals, organizations, and federal agencies, there is a perceived paucity of health data in Nigeria. Healththink solves this issue by collecting data from numerous and disparate sources and creating a databank. Aggregated data is cleaned and standardized into a unified format for easier data analysis and manipulation. 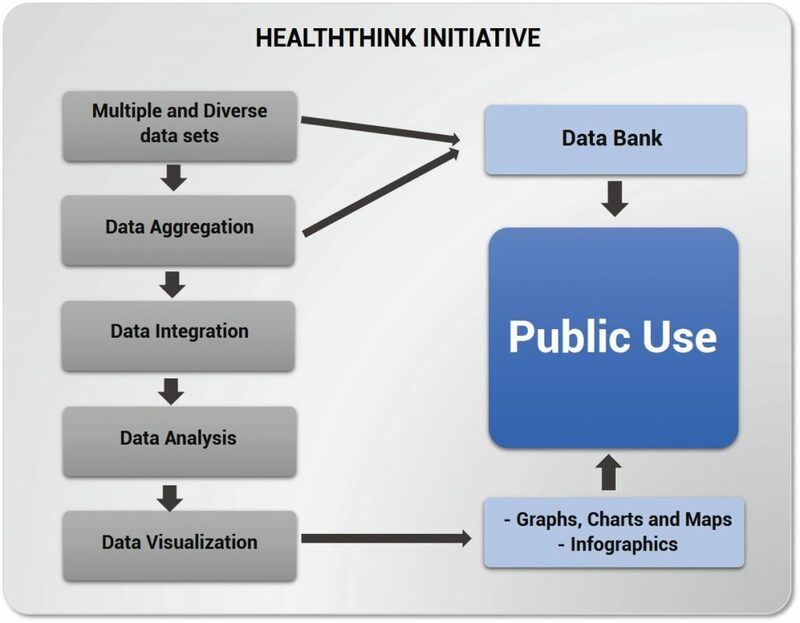 The “Data API” Menu in the Healththink website provides the links to data sets that have been standardized into a common format. The “Browse Data” menu of the healththink website shows aggregated and integrated health datasets that have been analysed to provide clearer views of the health status of populations across various variables. These unified data sets are freely available for use by the public thus serving as a bank for various datasets. This is because we believe in open data and data sharing, Healththink also solves the challenge with trying to find necessary health data to guide research and decision making. Furthermore, data collection is expensive and time consuming. On the “Submit Data” menu, users can submit their raw data for use by others. On the “Submit Request” menu, users can request for raw data when they need it. This eliminates the need for primary collection of already existing data, saves time and resources and promotes a culture of data sharing; a culture that is essential to improve the process of health research, and promote faster progress towards achieving health for all. Healththink also provides the right analysed data for you at the right time. There is no longer a need to spend hours looking for health information, when what you need can be instantly obtained from the website. After data has been aggregated, integrated and analysed, it needs to be communicated effectively. Inadequate or inaccurate health communication will result in either misunderstanding or misinformation by end users; an end result with severe consequences. When data is presented in texts and numbers, vital information can be missed out. Time trends, health patterns and disparities may not be easily recognized if they are not presented in images like graphs and charts, thus the need for Data Visualisation. At Healththink, big data is analysed and presented in images for visual presentation so that everyone understands and absorbs the story the data is trying to tell. Most importantly, it ensures that the right kind of image is presented for the right kind of data. Healththink goes beyond just data visualisation to designing of infographics. Infographics are a necessary supplement to data visualisation. They tell a rich story, because they present a lot of information in formats that are more captivating, and easier to interpret and share, hence, ensuring better inclusion of the general public in the utilization of health data. At Healththink, infographics are regularly designed on trending health topics and urgent health needs to guarantee more informed and engaged citizens; an important foundation for citizen engagement and advocacy. Other important features like the Blog and Dashboard enrich the Healththink website by providing enhanced clarity to health information needed to inform and inspire us to make vital decisions and take necessary action. Health think is for every one of us. It is for that student that is puzzled about what health research to carry out, and needs useful information to help guide his/her research. It is for those organizations who need to make public health interventions, and require health data (raw or analysed) to identify priority areas. It is for that citizen that may be uninformed or misinformed about health, because health information is not communicated correctly, or is too difficult to understand. It is for the general public that need health information readily available, to hold government accountable as well as drive citizen engagement and advocacy activities. HealthThink is for Nigerians to use the health information collected from them, by them to drive progress in the country for us all. Pisani E and Abou-Zahr C. (2010). Sharing health data: good intentions are not enough. Bulletin of the World Health Organization. Volume 88, Number 6, 401-480. ***This post originially appeared on eHealth4everyone.com***.